NOVOL distributes products on a great scale to Western and Eastern Europe, New Zealand, the Middle East, and Africa. We manufacture 1300 over different products on 10 production lines. Our manufacturing and store rooms comprise over 17,000 square metres. The annual production output is 18,200 tons with 13,000 tons exported to almost 50 countries across the globe. The needs of specific markets are addressed by our trading partners in Germany, Russia, and Ukraine. The company was established in a small, ninety square metre workshop. At the time, a limited assortment of products made with the use of hand tools was enough to satisfy the local market needs. 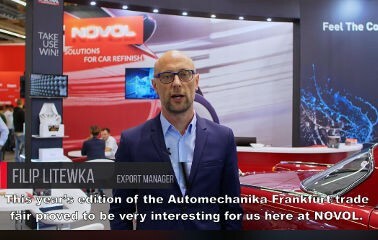 Summary of the Automechanika 2018. NOVOL held in Beijing between 1 April and 4 April 2018. 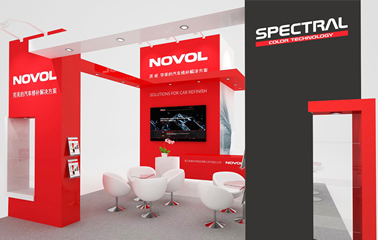 During this year’s edition of AMR, NOVOL will showcase its top-of-the-line SPECTRAL COLOR TECHNOLOGY, a system of coat and colour mixers. Other featured products will include the PROFESSIONAL line. 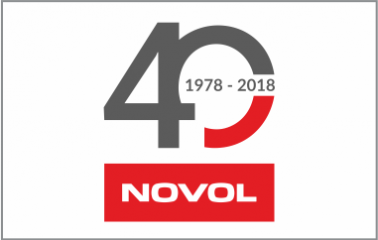 The beginning of 2018 is special for us, because it has been 40 years since the founding of NOVOL Company. On this occasion we have prepared a series of interesting events, contests and surprises for you. We will regularly write about it on the NOVOL40 FB profile. We invite you to follow the process of renovating our age-mate - Polish Fiat 125p from 1978. Especially for this event, we have created a separate FB profile - NOVOL 40 for 40 - all of you who are interested in details are invited to visit this site regularly. More anniversary contests and surprises coming soon. Watch our profile and celebrate the anniversary with us! The leaders of the automotive industry will be showcasing their latest products and trends at the INTERAUTO show in Moscow, which begins on 23 September. 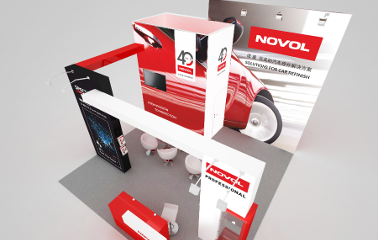 NOVOL's exhibition stand will feature the Spectral BASE 2.0 colour mixing system, the Cobra Bedliner protective coating solution, and other NOVOL automotive brands. 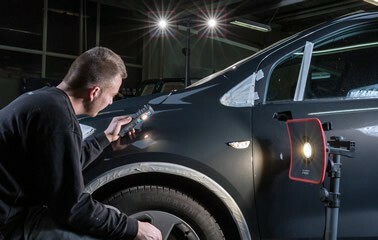 The special highlight of our appearance in Moscow will be our virtual paint shop, where all visitors can test their car painting skills. Each challenger will be awarded a Virtual Painter's Certificate. Visit us on 23-26 September 2017 at Booth H430 in Hall 1. We are pleased to inform that NOVOL again will be a participant of The Auto Trade Fair in Gothenburg (18-21.01.2017). 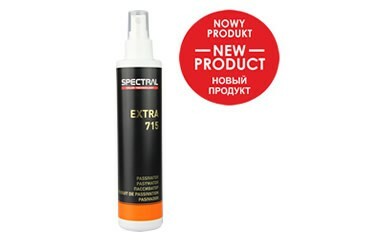 During this time we will present - SPECTRAL COLOR TECHNOLOGY,PROFESSIONAL, ULTRA LINE, NOVOL for Classic Car, Cobra Truck Bedliner and Quattro - polishing and abrasive materials. 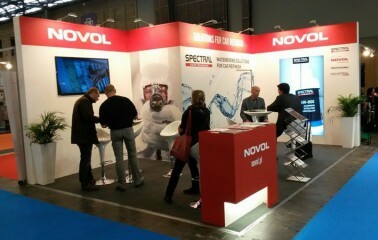 We invite you to visit our stand D02:20 where you will be able to see our new products! 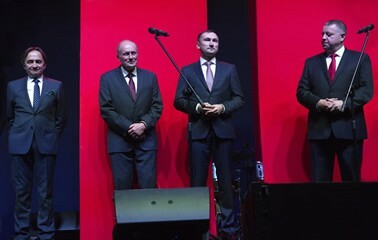 The finale of the 19th Fair Play Business edition (Przedsiębiorstwo Fair Play), a programme for the promotion of corporate ethics, was held in the last week of November. NOVOL, which entered the Fair Play Business programme for the 17th time, once again was awarded the Fair Play Main Award statuette. 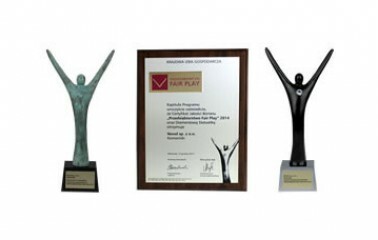 Since the first edition of Fair Play Business, we have been committed to high standards of business ethics. 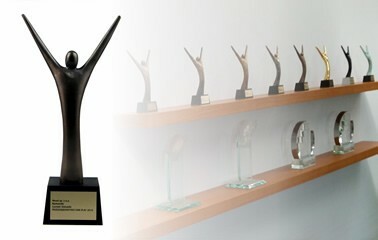 This year’s Fair Play award confirms our commitment to taking the right path. Thank you for this recognition! 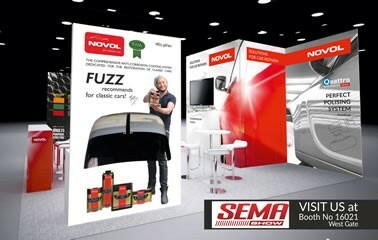 NOVOL for Classic Car wins SEMA Global Media Award! 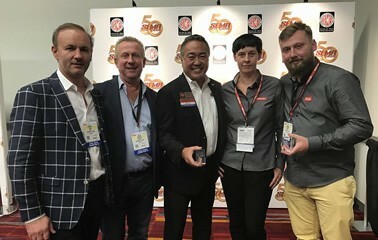 We are proud of the fact that, of the 3000 novel products shown at SEMA, the industry journalists from around the world chose to award our NfCC product line. According to its decision, the Jury recognised our commitment to creating an end-to-end coating system for the renovation of classic cars, a great improvement in quality for vehicle repairs. Thank you! 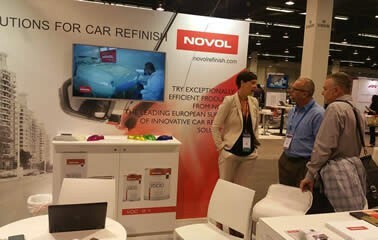 Between 9.08-13.08 we were at the Motor Show in Anaheim NACE CARS. Events was dedicated to the automotive service and repair industries. 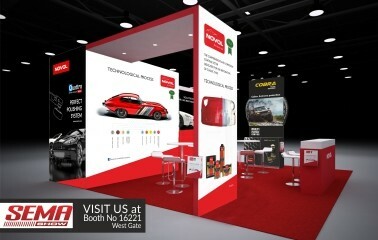 NOVOL was featured its products dedicated to the American market and NOVOL for Classic Car. See a short movie from the car tests conducted by our racing crew, Łukasz Byśkiniewicz (driver) and Maciej Wisławski (pilot), prior to the 12th Gdańsk Castrol Inter Cars Rally. On 8-10 May 2016 the Automechanika Dubai is held. It is the largest international trade and networking event for the automotive aftermarket in the region. 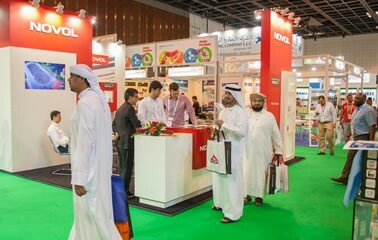 It is a great opportunity to present the offers, new products and to make new business contacts. Special thanks to our guests from the United Arab Emirates, Saudi Arabia, Qatar, Oman, Bahrain, Pakistan, Syria, Turkey, as well as China, India, Kenya and Sudan. 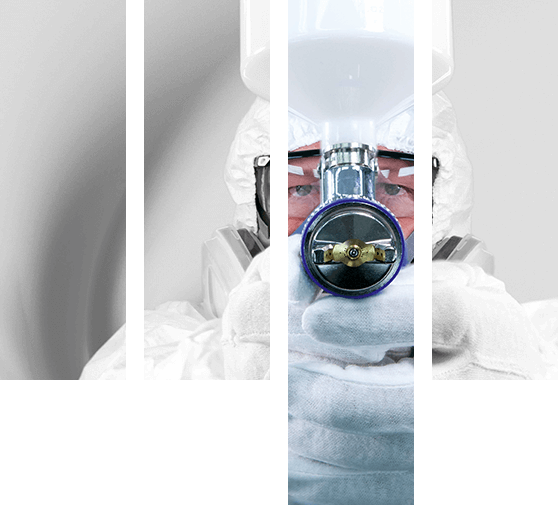 Our stand features PROFESSIONAL line products, SPECTRAL technology, INDUSTRIAL coating process, ULTRA fast repair line and IMPACT (designed for end-users who work in the conditions of high temperature and humidity). 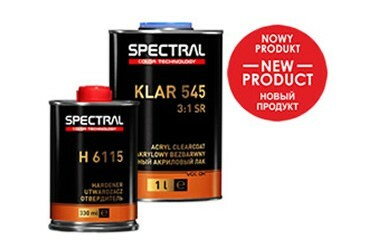 Spectral KLAR 545 is a fast clearcoat intended for increasingly popular spot repairs that entail up to three car body elements. 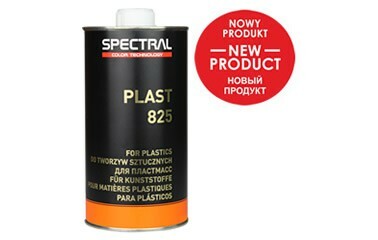 The product has a drying time of 15 minutes in the painting booth and 5 hours in open air at 20°C, which greatly helps reduce the repair time. 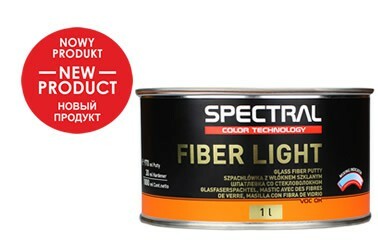 The clearcoat is applied in two thin layers. The SR (scratch resistant) additives make the product develop a high level of hardness, irrespective of the drying temperature. 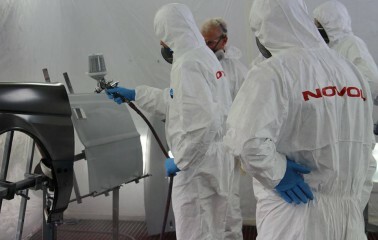 An excellent choice for fully equipped body workshops and simple shops without painting cabins. The 2nd Polish Championships of Junior Painters - summary. 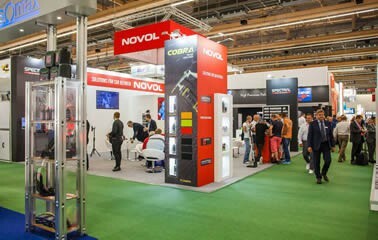 NOVOL on FSB trade in Cologne. 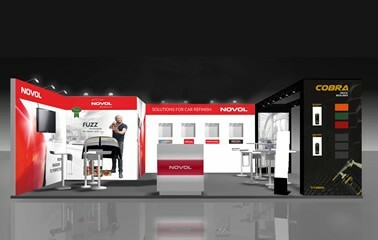 We are pleased to inform that NOVOL will be a participant of FSB trade in Cologne (27-30.10.2015). 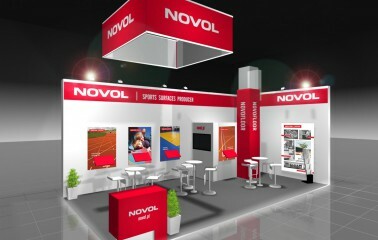 During this time we will present our line NOVOFLOOR - a modern sport surface system. 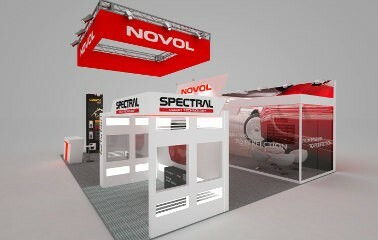 We invite you to visit our stand nr G029, hall 10.2. EQUIP AUTO is an event for industry professionals and features the products required for the design, production, operation, servicing, repair and maintenance of motor vehicles, and this does not only include passenger cars. 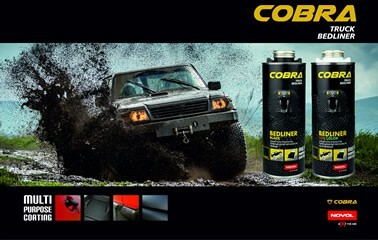 EQUIP AUTO showcases products for trucks, buses, coaches, construction and utility machines, tractors, military vehicles and motorcycles. 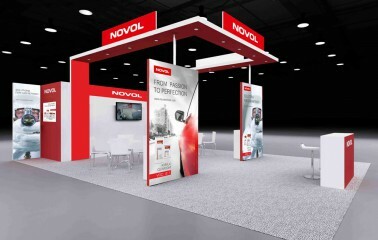 The NOVOL display stand features a complete line-up of our SPECTRAL, PROFESSIONAL, INDUSTRIAL and NOVOL for CLASSIC CAR products. Remember the 1st Polish Championships of Painters that were held between the 10th and 12th of April this year? 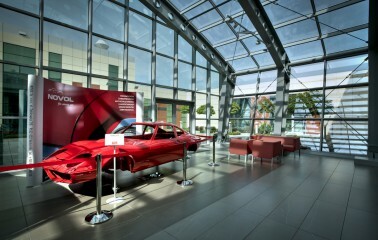 We co-hosted this event with the Poznań International Fair and V8 Team. The event included a competition in the mastery of theory and testing of practical skills. Why do we remind you of it? In the second half of September we had the pleasure of hosting the best competitors of the Championships on a training course dedicated specifically to them, where they became acquainted with different applications of Novol products and technologies – both in theory and in practice. See the training course photo gallery here. 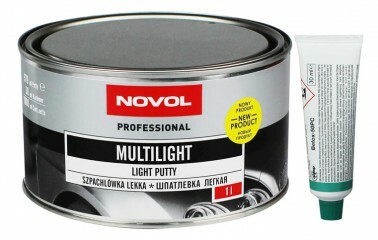 MULTILIGHT is a multifunctional polyester putty for filling and finishing. Thanks to the special fillers it contains, the product's density is about 40% lower when compared with conventional putties. 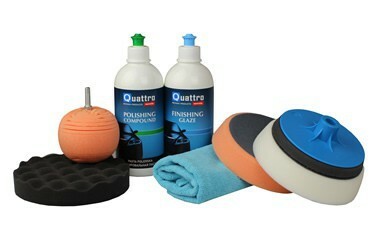 Additional features of the putty are its smooth surface after application, high surface dryness and superb treatment. 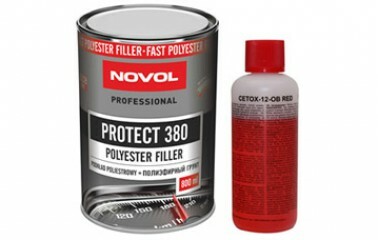 NOVAKRYL 520 is a clearcoat with high solid particle content. The product dries quickly and gives a high gloss and great depth. 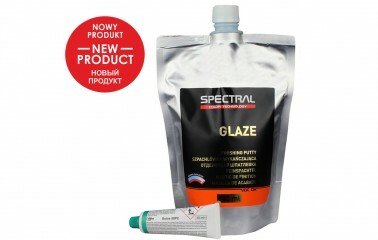 The clearcoat achieves high ending hardness both at elevated temperatures and without heating. 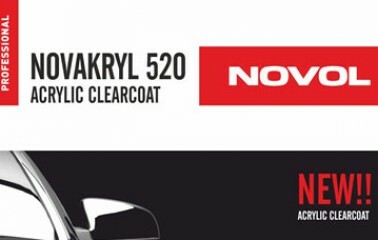 The Novakryl 520 meets the requirements of Directive 2004/42/EC of 21 April 2004 on the limitation of emissions of volatile organic compounds. It is UV and weather resistant. 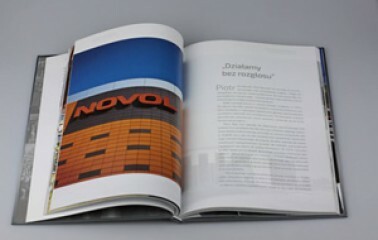 NOVOL featured in "Greater Poland. 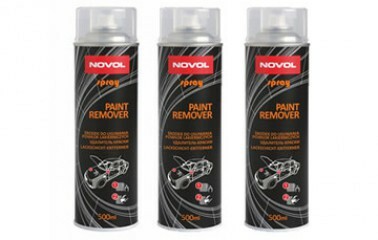 25 years of free economy"
NOVOL is particularly focused on improving work efficiency at painting shops. Hence, we provide training courses for painters and on-site presentations of our systems. Our numerous satisfied customers get their education at the NOVOL Training Centre. The students apply from Poland and bothWestern and Eastern Europe.We have an average of 5000 participants per annum. To meet customer demands, our Representatives and Technicians do system presentations at customer's locations. The personnel maintain relations with the customers and ensure the best quality of cooperation. Their duties include cost optimisation consulting and painting technology supervision. I understand that the personal data provided in the form will be processed by the Personal Data Controller, NOVOL sp. z o.o., with the registered corporate office at: Komorniki 62-052, ul. Żabikowska 7/9, solely for the purposes and pursuant to the principles established in the Personal Data Protection Notice.